…as in close to the end of the endless stockinette. Don’t let that little garter ridge fool you – the border of this piece is garter stitch worked in the round. yep, knit a round, purl a round. It might as well be stockinette! Yesterday I was hopeful I might have a new project to share today, but turns out the last four rows of red, then picking up 200+ stitches and putting another 500+ on the needle … well, now I’m just glad to have a new color to share with y’all. and an almost color-coordinated book! 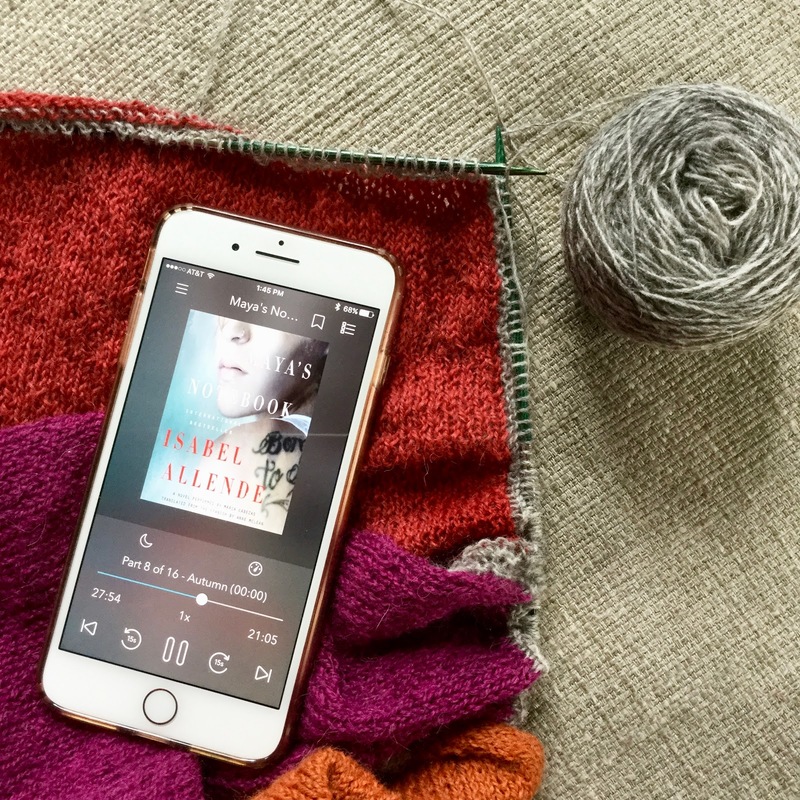 I’m reading the last book for summer bingo so I went back to the Read Harder challenge for an audiobook. This one fits the “book set in South America by a South American author” category. So far so good. Joining in with Kat today and looking forward to seeing what y’all are knitting and reading! p.s. in case you missed it – yesterday I shared a link to a very short survey that a local young man – working on a project with Georgia Tech to explore technology solutions to help crafters – put together. Please click here if you have a few minutes to help him out. I will never have a new project on the needles, at least it feels that way 🙂 I love your project and I hope you bravely make it though the last bit of knitting. I'm listening to Anna Karenina and that's my last summer book bingo book, too. So yesterday I started reading The Snow Child and I love it! That is going to be one stunning stole! I can't even imagine having a coverall for Bingo. Wow! I really love the colors of this project too! I did the knitting survey today! Wow! That's a ton of stitches…but so very, very beautiful. Cannot wait to see the end product. My reading has slowed somewhat, but I may yet get a bingo…time will tell. However, I've gotten tons of great suggestions of books and that's what means the most to me anyway. I love her books, I haven't read this one, so I guess that means I need to add it to my list!